The locomotives diesel for long services had an impulse and an implantation almost definitive in the 40s and 50 in the railroads of the United States. The one that at the time was a new technology re-turned the railway American system of exploitation. Even, the locomotives diesel – American electricity companies were a political instrument that were indicating the economic and military level of the USA and his areas of influence in the epoch of the cold war. 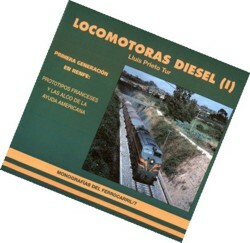 The technology of the locomotive diesel came to the Spanish railroads in the 50s, as to many European countries. The principal problem was to finance the purchase and construction under license of this new type of technology. These years, the massive construction of steam locomotives still was allowing to have a relatively new park of traction. In addition, the politics of renovation in the network of broad route was orientated in the electrification of the principal lines and to replace structural deficiencies in general. The arrival of the first locomotives diesel American and French to RENFE created the situation of which RENFE chose for the Americans of direct import and the Department of Public Works, in his plans for narrow gauge, chose for French locomotives constructed in Spain. RENFE's option for locomotives acquired diesel of line Americans was the same that that of other countries without aptitude to construct them. The Americans in addition were offering financial helps for his acquisition, unlike the Frenchmen. First diesel of line in RENFE, the series of ALCO 1600 and 1800 opened a new style of explotation in the network but only they opened the door the massive dieselización that took place in the PDM in 1964. The previous studies, the French prototypes and the slight trains proceeding from the USA (TALGO II) realize of RENFE's intentions to adapt to the new railway currents, more of the USA that to the European zone, fruit of two policies proceeding from the neutrality in the World War II that allowed the development of the Swiss and different industry fruit of a politics of competition to offset the American dependence in Europe after the World War II. The locomotives 318 and 316 initiated an epoch that continued with other acquisitions America as the 313, 321, 308 and 319. Size: 22 X 20 X 1 cm.